There are 146 wildfires burning in Alaska today. A total that is likely to see at least another dozen blazes added to it by midnight. A total that has already absorbed the entire firefighting capacity of the State and has drawn hundreds of firefighters from across the country in places as far away as Pennsylvania. 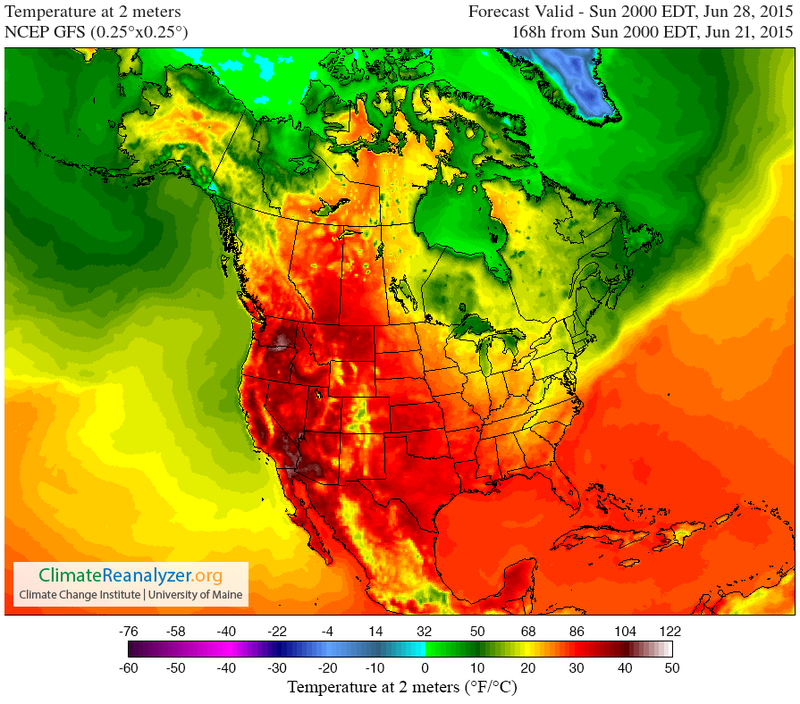 For Alaska, it’s a case of record heat and dryness generating fuels for wildfires. Deadhorse, at the center of North Slope oil fields above the Arctic Circle set an all time record high of 82 degrees Fahrenheit (28 Celsius) on Sunday. That’s 3 degrees hotter than the previous all time record high of 79 degrees (26 C) set on August 16, 2004. The hottest reading for June at that location was a 68 degree (20 C) measure set in 2007. So, basically, Deadhorse just shattered the all-time record for June by 14 degrees (F) and the globally record hot summer of 2015 has only now gotten started. Other locations experiencing new records for just Sunday included Kotzebue, which set a new all time record highest low temperature of 62 degrees (17 C). This reading broke the previous all time high minimum mark of 56 degrees (14 C), set in 1987. Bethel and Yakutat both tied their daily high minimum temperature records at 54 and 52 degrees (12 and 11 C), respectively. And yesterday was just one day in long period of record heat for the State. Last month’s NOAA analysis showed temperatures fully 7 degrees Fahrenheit (4 C) above average. It’s a record heating that is now setting off severe wildfires all over Alaska. According to the state’s Wildland Fire Information Center, the relentless heat and dryness has turned spruce, hardwoods, brush, and tundra into dry fuels vulnerable to any ignition source. Over the past week, ignition has come in the form of lightning — with most of Alaska’s 2015 wildfires set off by nature’s spark. As a result we are seeing nearly double the number of fires during June compared to a typical year. Fires that have already destroyed 30 structures, forced evacuations, and tapped Alaska’s firefighting resources to its limits. Record hot temperatures and wildfires, unfortunately, are not just an issue for Alaska. They’re a prevalent concern all up and down Western North America. A zone that has seen several years of record hot temperatures and dryness. Extreme weather events fueled by such global warming-linked phenomena as a Ridiculously Resilient high pressure Ridge over the Northeast Pacific that has kept heatwave and drought conditions firmly entrenched throughout much of the region for months and years. An atmospheric condition that is also linked to a hot ocean surface water ‘Blob’ in the Northeast Pacific (which is itself implicated in a growing number of marine species deaths). 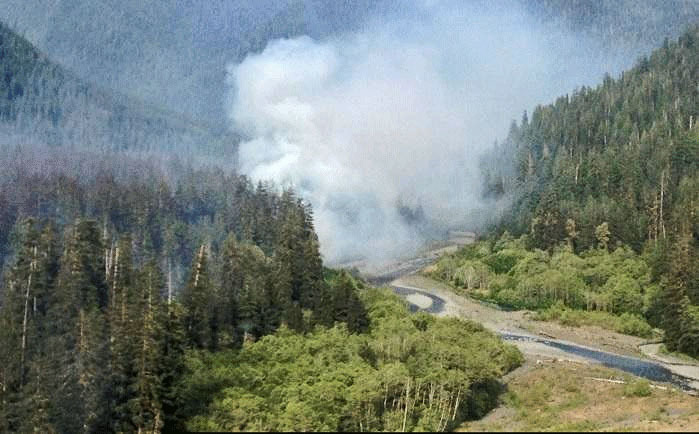 This week, the added heat also generated wildfires in unusual areas like the rainforests of Washington State’s Olympic Peninsula. Driest conditions since 1951 have resulted in a great deal of fire resiliency loss for forests in the region (1951 was the year of the historic Five Forks Fire, one of the worst ever to impact Washington State). Already, a rare early summer wildfire (called the Paradise Fire) has burned through 417 acres of forest. Firefighters are doing their best to contain the blaze. But the record heat and dryness are multiplying fuel sources. Fires are enabled by dried lichens growing high up in the trees. When flames touch the lichens they rapidly ignite sending sparks to other lichen-covered tree tops. In this way, flames can leap rapidly from tree to tree under current conditions. 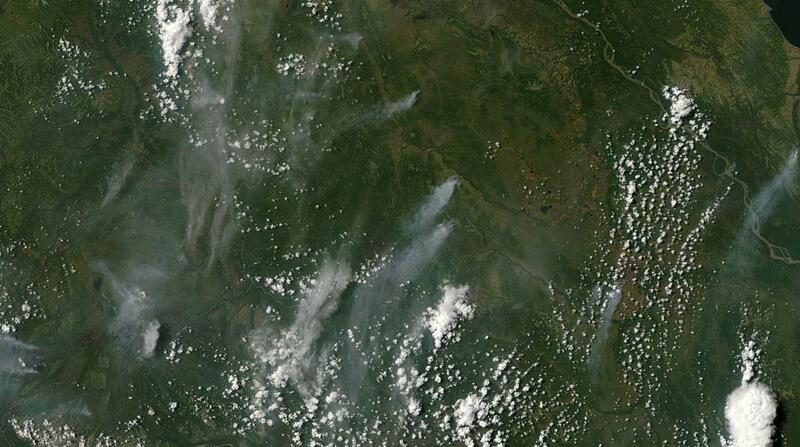 It’s very unusual to see fires in this rainforest zone. And when ignitions have occurred in those very rare cases, they have typically flared during late Summer and early Fall. So this June burning has fire officials very concerned — especially given the nearly unprecedented fire hazard conditions throughout the State. Conditions that are predicted to rapidly worsen as an extreme heatwave is expected to build through the coming weekend. Temperatures over large stretches of Washington and Oregon are expected to climb into the 90s and 100s, possibly reaching the 110s (Fahrenheit — Celsius range from 33 to 45) by Sunday. For these typically cool, wet States, this brutal heat blow, should it emerge as predicted, will set off a spate of all time record high temperature readings, deepen drought conditions extending northward from California, and heighten fire conditions that are already in the range of worst ever experienced for sections of these States. Moving further south along the U.S. West Coast we come at last to the drought hot zone that is California. A State that is now enduring its fourth year of drought. A drought that tree ring studies show is likely the worst such event in 1,000 years. These harsh climate conditions were starkly highlighted this weekend as reports from State emergency planning officials now indicate that California is currently experiencing its worst fire conditions on record. We measure the fuel moisture content of all of the vegetation -the brush and the trees and we track that over the course of time and compare it month to month each year. And we put it through formulas and determine how much energy and how much heat it will put out when it’s burning. And we have seen -we saw it last year and we will see it again this year- we’ll be reaching records for potential heat output for times of the year that would normally not be burning in those conditions. So far this year over 1,100 wildfires have already ignited throughout the State. That’s nearly twice the typical number of 650 blazes popping up by this time of year. Exacerbating this stark context is a state water resource crisis compounded by non-existent Sierra Nevada snowpacks and dead trees that now number in the millions. Record and unusual Alaska, Washington, and California wildfires this season are, thus, not occurring in isolation, but as an inseparable feature of ongoing climate trends related to human-caused global warming. In this case, heatwaves are related to visible and extreme record ocean and atmospheric temperatures that have been ramping both globally and in the regions affected over past years and decades. And the fact that 2015 is continuing as the hottest year on record globally should also not be viewed as separate from the events witnessed all up and down the North American West Coast. Events that were largely predicted in many global climate models assessing the impacts of human based greenhouse gas warming on this vital national and global region. These rapidly proliferating fires cover a diagonal swath stretching about 800 miles from southwest to northeast across the state. 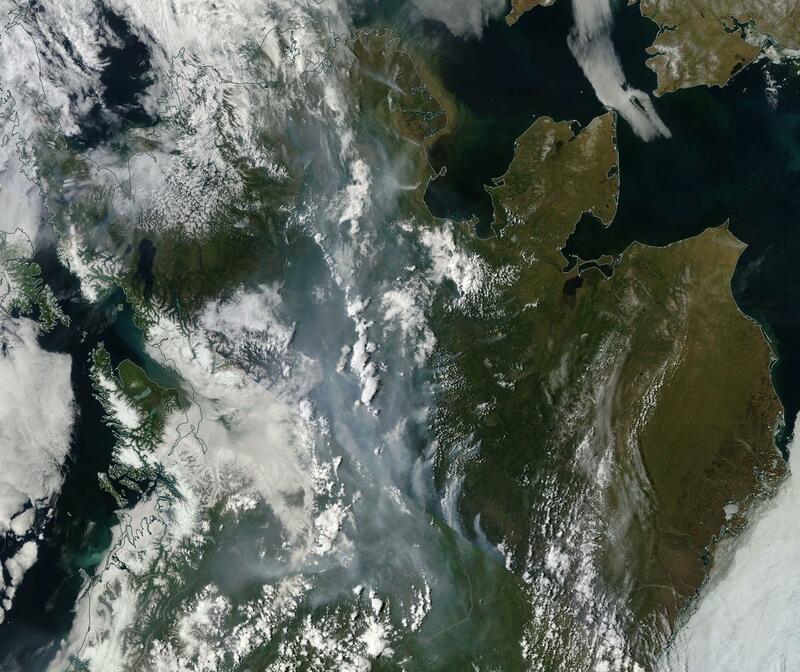 The fires are burning through Alaska’s permafrost zone and current intensity in the satellite image is similar to some of the worst Arctic fires we’ve seen during recent years. 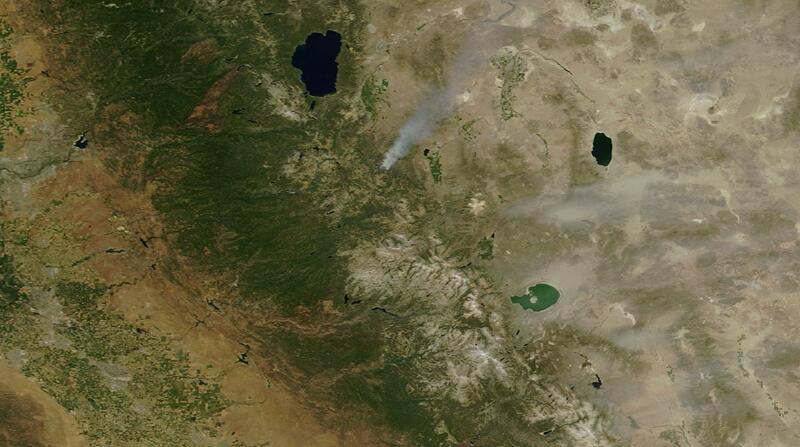 A substantial number of these fires feature smoke footprints indicating 5-10 mile active burn fronts. Smoke plume size is now large enough to become caught up in the Jet Stream and impact visual features of skies across the Northern Hemisphere. Based on these satellite shots, it appears that Alaska is experiencing a heightening and very severe fire emergency — one that shows little sign of abatement over the next few days.